Kerry Lyn Sparrow's hilarious picture book story offers a new take on a universal experience. Using delaying tactics to avoid going to sleep at bedtime is a common routine for young children, and they'll love the sly humor when Duncan's own tricks get turned on him by the (“sheepish”) sheep. 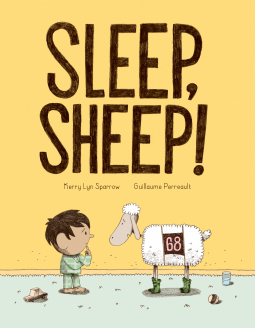 In subtle colors with lots of telling details, Guillaume Perreault's illustrations bring Duncan's bedtime rituals and his unexpected sheep guests humorously to life. This book makes a fantastic, funny read-aloud, appealing to both children and adults. A graphic designer by training and a native of Rimouski, Guillaume now works as a freelance illustrator and author. His techniques vary according to his projects, but the balance, the contrast and the humor are elements present in all his works. Youth publishing is his main niche, but he also touches on the exhibition, collectives, collaborations and is currently working on adult graphic novels. This fantastic story about counting sheep at bedtime was a hit with our 5 year old, J. His favorite part was when the mother prepares the boy’s room with everything he may possibly need for bedtime. We have finally reached the place where bedtime is enjoyable with J. The struggle is still very real with our 3 year old though. She is very much like the little boy in this book, except our process often involves tears. When the mother suggests to the little boy that he count sheep I asked J if he knew what that was. He said he saw it on a show once but he didn’t know why you do that. I believe the book did a great job of connecting the idea of counting sheep for sleep and illustrating the concept. When we got to the part where sheep number 68 is hesitating to jump I asked J if this sheep reminded him of anyone else. He was able to identify that the sheep was like the boy avoiding sleep. As a librarian I think this book would be a great checkout book. The illustrations are cute and the story is fun. I think my elementary students would love it. It does not jump out to me as a story I would utilize for a lesson and I can not think of any connections I could recommend to my classroom teachers to use it for. Sleep, Sheep! is a great bedtime story!